Official synopsis: "Project Exodus - a mission to transport 300 Americans from 2070 to 54AD to overthrow the Roman Empire - has gone catastrophically wrong. Half have arrived seventeen years earlier, during the reign of Caligula. Armed with knowledge of the future, Caligula is now more powerful than ever. But with the office unmanned - and under threat - how will the TimeRiders make it back to 2001 and put history right?" 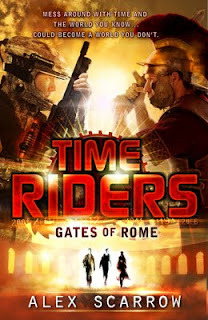 The fifth book in Alex Scarrow's incredible TimeRiders series, Gates of Rome looks set to take the series to all new, and outstanding heights as we travel back to Ancient Rome. The cover work you see before you is perhaps one of the best covers I've seen in a long time. Such strong imagery and colours. I love it! I've read the first three books in the series, with the fourth The Eternal War, currently high up in my "to read" pile. The series look stunning together and with this one added it's only going to look even more impressive. Each book just gets better and better and I really cannot wait to see what Alex has in store for us... well, after I've read Book 4 that is!! Thank you Ryan....really hope you enjoy ETERNAL WAR and this next one. So fat it's been a real blast to write!